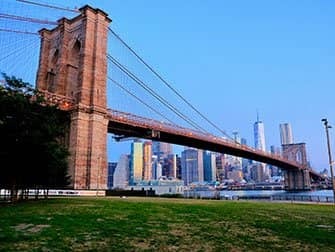 Brooklyn Bridge Park in New York is located, as the name suggests, right under Brooklyn Bridge, on the water. The 34-hectare park is known for its gardens, footpaths along the river and rolling hills that keep the traffic at bay. Most noteworthy however, are the breathtaking views of Manhattan. The park is divided in to sections, each with their own charm. 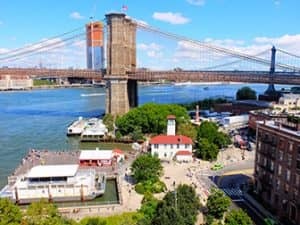 Pier 1, Pier 2, Pier 3, Pier 4, Uplands, Greenway, Pier 5, Pier 6, Squibb Park and Bridge, Main Street, Fulton Ferry Landing and Empire Fulton Ferry. 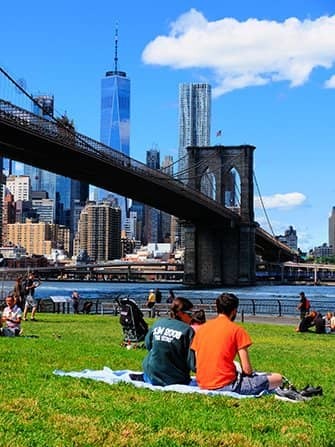 Many New Yorkers choose to sit on the steps of Brooklyn Bridge Park, furthermore, you can head to the beach by Pier 4 or sit on the lawn. There are endless opportunities for various activities: sports fields, running and cycling paths. Sports Fanatics enjoy Pier 2 and Pier 5 and, if it rains, continue your activity at Pier 2 where part of the sports area is covered. Another way to explore the park is to cycle. The bike path, Greenway, runs from Pier 1 to Pier 6. It’s not permitted to Cycle outside of the bike paths. Did you rent a rowboat? You can dock it on the ramp at the beach by Pier 4. In addition, you can go fishing by the western promenade at Pier 5. Catch anything? They have all the necessary tools to clean the fish on the spot, and the barbecues of Picnic Peninsula are nearby! Summer brings the annual pop-up swimming pool back to Brooklyn Bridge Park. The famous lobster rolls from Luke’s Lobster can be found at Brooklyn Bridge Park. However, nothing stops you from bringing your own sandwiches, if you wish. The park even has allocated picnic areas. Bringing your own alcohol is not permitted, but it can be purchased at the many bars and cafes around the park. 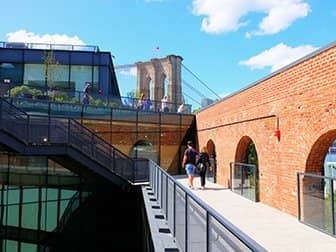 Located on Pier 1 you can find 1 Hotel Brooklyn Bridge. From their rooftop you’ll get one of the best views of Brooklyn, looking over Brooklyn Bridge Park and the Manhattan skyline. Also, Fornino at Pier 6 offer great pizza and signature cocktails at picnic tables on the rooftop terrace with a view of the Statue of Liberty! By the water between the Brooklyn Bridge and the Manhattan Bridge, you can find an old warehouse that, these days, serves as home to a variety of shops, restaurants and offices. 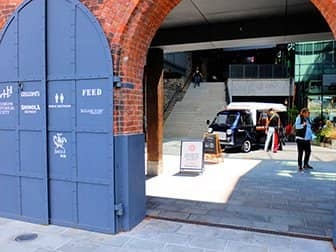 It is a nice building and worth a visit if you are in the neighbourhood. The view from the roof over the park, the Brooklyn Bridge and the skyline is awesome! In the building you can find, amongst other things, a furniture store, various restaurants and the Brooklyn Historical Society. There are several playgrounds for children in the park, especially near Pier 6. Furthermore, there is a beautiful, antique carousel: Jane’s Carousel. 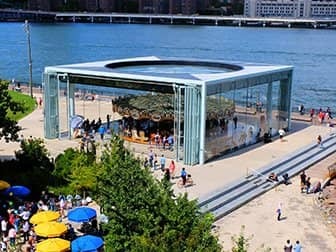 You’ll find it in a glass pavilion near Empire Fulton Ferry. If you would like to find more activities for children, please click here. 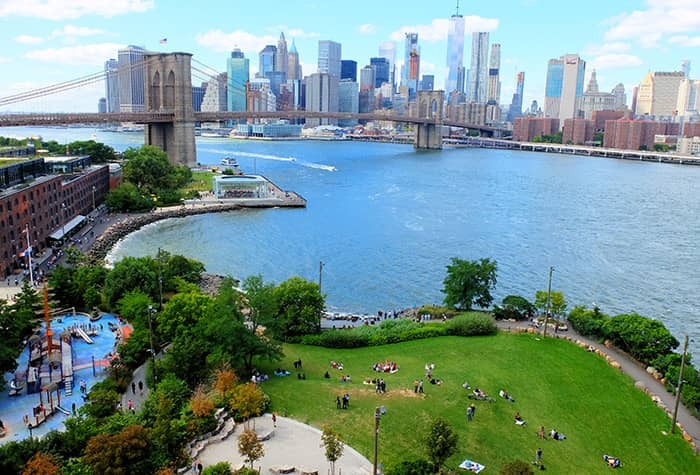 Opening Hours: The Brooklyn Bridge Park is always open, except between 01:00 – 06:00. Getting there: Subway A/C, 2/3, 4/5, F and R take you to the park or bus B25 and B63. The water taxi operates in season. You can also take NYC Ferry.